Our family pet keeps me company when I’m home alone. Some of you may remember that I was opposed to owning and taking care of our pet. I was not happy when Emmy received Stripe and Spotty for her birthday; no one had consulted me about this gift. In the end, I embraced the fish. A week later, Spotty was no longer with us. Stripe proved to be the hardier fish. Nine months later, I admit that I talk to Stripe when I walk by his tank. Lily runs to the fish tank as soon as she walks in the door after school to say “Hi!” to Stripe. At dinner time, the whole family asks each other, “Who fed Stripe?” He comes up to the top of the tank and blows bubbles when we come to feed hime. He’s one smart little fish. The other evening, I sat on the couch to read. As I glanced over at the fish tank, I panicked when I thought I saw Stripe floating at the top of the water. As I hurried over to check on him, Stripe swam around and looked at me as if I were a crazy lady. He was perfectly fine. Maybe I am a crazy lady; a crazy FISH lady. All I know is, when it’s Stripe’s time to leave this earth, it will be awfully hard to replace him. Hey, Elmo talks to his fish, too! 🙂 I've had fish in the past, but I've never really gotten attached. Here's hoping that Stripe lives one long and full life as the family fish! My recent post Motivation lost? We had a fish, Swimmy, and he (she?) lived for so long when I was a kid. The only one. My mom got quite attached and she was always to one to feed him (her?) and clean the tank. That was very sad when Swimmy finally lived. I'd like to believe it was a happy life, and long for a fish. My recent post Sun Halos and Loose Moose. That is so cute Ginny! I used to worry that a still fish was dead too. Glad you found a new friend. Hope you are doing well! I love that you talk to your fish! 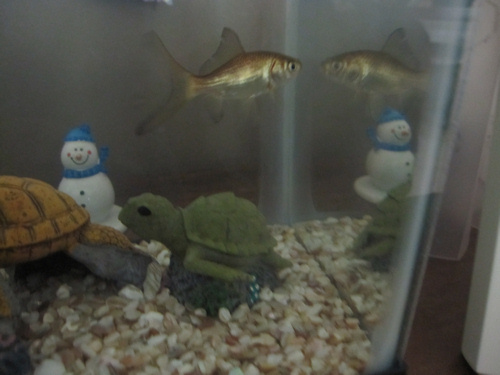 We had a big fish tank when the kids were very young. My daughter would move her walker right next to the fish tank and watch them float around for the longest time! Ah! WE are still morning the loss of Arceus the goldfish. Jude had him for two years, which is pretty long for a goldfish. I'm thinking that we're going to need to purchase a replacement soon. Hopefully, this one will also be long-lived. Like Stripe. You are finally linked. I was out running errands and couldn't get to the computer – sorry. Oh, for heaven's sake, don't apologize! If only I could get my Spins done sooner….I'm just happy when I actually write something! Awwww… Nothing wrong with making friends with a fish! 🙂 I hope he lives a long life! My recent post Top 25 Foodie Moms – MommiFried Was Nominated! I hope our fish lives a long life, too, especially since my daughter has grown so attached to him! My husband REALLY wanted a fish tank for our son (or himself, still not certain which). I do enjoy watching them swim around, but we didn't name ours. Probably because three of them look alike. Fish do tend to all look the same, don't they? It's easy to keep track of just one!